Would you like to write for Guidelines in Practice? Guidelines in Practice provides expert, practical, credible information through its evidence-based, multichannel content. Our articles and educational projects provide evidence-based perspectives and content on a range of clinical topics, supporting you with your learning, best practice, guideline implementation, and local decision-making. 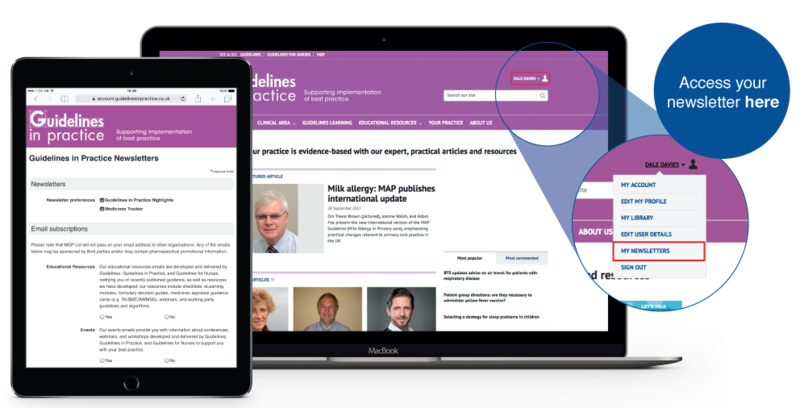 The Guidelines in Practice team works closely with its Editorial Advisory Consultants, plus many organisations, including NICE, to develop content on new and updated guidance and evidence-based practice. Registration is free for all UK-based doctors, nurses and pharmacists—you will gain full access to content online and on the app. We appreciate how valuable other healthcare professionals find our content, which is why we have developed a range of low-cost subscription options. If you are a registered healthcare professional, and a member of a professional body, please contact us directly as you may be eligible for a special deal through your professional body. Registration is free for all UK-based doctors, nurses and pharmacists. Other healthcare professionals can access a low-cost subscription. Once you have registered with Guidelines in Practice, you will be able to update your areas of interest and responsibilities, and email communication preferences, which will ensure we bring you the most relevant content. If at any point you would like to review or amend the emails that you are subscribed to receive, log in and visit the ’My Newsletters page’. The presence of the Guidelines in Practice independent content (IC) logo ensures you can be confident that an article has been developed solely between the expert author and Guidelines in Practice. an event that you wish to include in our listing. Articles on new and current guidelines, guideline implementation locally, best practice, and other topics of interest to clinical primary care practitioners are welcomed. All articles submitted for publication must be original, and should not have been published before, or be currently submitted for consideration by any other publisher. Articles about new or updated guidance should normally be 1000–2000 words in length, ‘personal view’ articles 500–1000 words, and short ‘hot topics’ 1200–1500 words. Articles should be submitted as Word documents by email to the Editor, Gemma Lambert. Please ensure you provide full contact details and affiliations for all authors, including email addresses for sending proofs, and attach a good quality (high resolution) head and shoulders photograph of the main author to go under the article heading. Tables and diagrams, particularly algorithms, are welcomed. All tables, diagrams, and graphs/charts should be mentioned in the text. It is essential to provide electronic versions of diagrams and graphs in the application in which they were created (e.g. PowerPoint or Excel), so that we can reformat or resize them if necessary. For graphs and charts, please provide sufficient data for these to be redrawn if necessary. Please include up to ten key points for the article, which will appear as bulleted points in a separate box. Please refer to other articles for the general style and approach. We are happy to send sample print page pdfs. Authors assign copyright of their article to Guidelines in Practice, but may use up to 15% of their own work after publication without seeking written permission, provided that the original source is acknowledged. We would be grateful to receive notice of when and where such material has been reproduced. Authors will require written consent to reproduce substantial parts of their own material. confirm all references are in Vancouver style. Advertising with Guidelines in Practice will ensure you reach an influential multidisciplinary audience. Established in 1998, Guidelines in Practice is widely regarded as a vital brand to communicate with key clinical decision-makers in primary care. Independent research through the National Medical Readership Survey of GPs (NMRS November 2017 – August 2018) indicated that Guideline in Practice achieved a 28% net reach of GPs. Circulated monthly to around 20,000 key individuals, and with an engaged online and mobile audience, Guidelines in Practice offers a cost-effective way of reaching key decision makers within the NHS.